When I first posted our living room tour many of you gave great advice on the curtain situation. 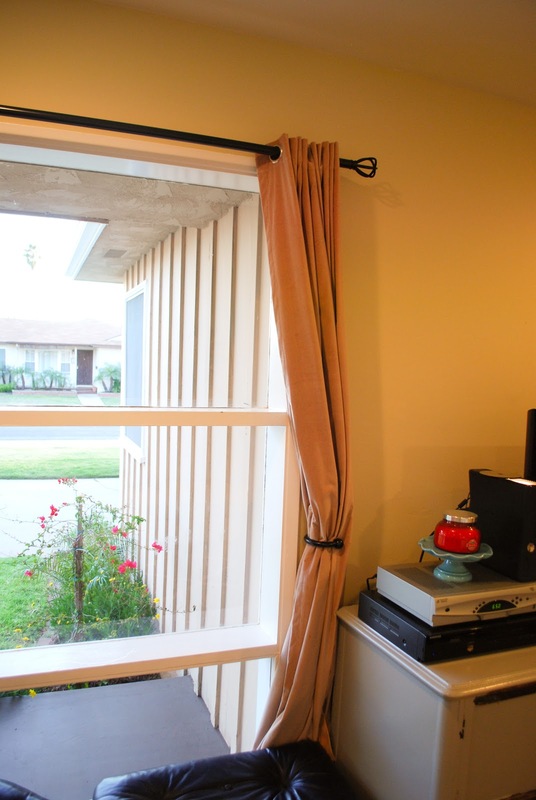 When we moved in there were four panels of beige brown, microfiber curtains which were hung on a black, iron curtain rod. Not horrible but also not my taste nor did it gel with my dream of "bright and airy". I tried some white curtains that I already had but it wasn't allowing any privacy and I had to buy two more panels to fit the width of the large window. So, I went on the hunt for white blackout curtains. They pretty much don't exist, if you were wondering. 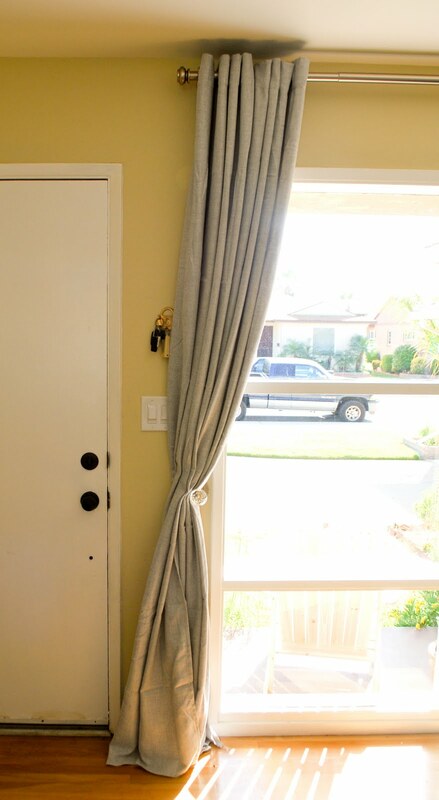 I ordered a pair online and got light beige curtains. Then I bought a pair of blackout panels at Home Depot for $25 a piece and when I got home I realized they were crunchy, a short width and more than what I wanted to pay. Then I headed over to IKEA because, as we all know, IKEA solves all of life's great decorating dilemmas (well, almost all of them). I obviously didn't iron these before I took this picture. Keeping it real, folks. ﻿At IKEA I saw these really beautiful smoky, gray-blue curtains at IKEA for $39 a pair with silver grommets (sorry I can't find them online which is weird). I know they're not the fanciest but I wanted grommets because I open and close these curtains every morning and every night and wanted something easy to use. ﻿﻿﻿﻿﻿﻿ Then I bought the curtain rod from Overstock in Pewter and I love it because it's kind of chunky and modern. I also moved the curtain rod almost to the ceiling because all the designers on HGTV told me to. And P.S., they're right when they say it makes your window look way bigger. To replace the black curtain tie backs, I got these antique door knob hooks from Urban Outfitters for $15 each. The plate was originally a brassy gold which I didn't love so I spray painted them a champagne color (this spray paint is my new fave). 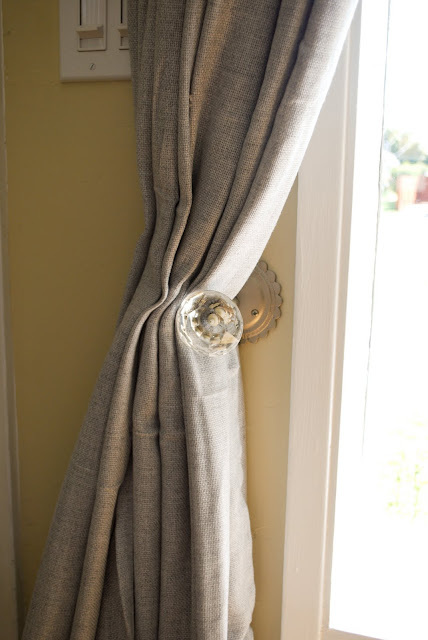 I love the curtains because they're such a pretty shade and have a wonderful texture to them. They're light enough that they still feel bright and airy but the color to them is more visually "fun" than I think white curtains would have been. However, they don't exactly provide a lot of light control so I'm still planning on searching for blackout liner to sew on the back. Any tips? www.fabricguru.com They have white or ivory - and it's $4.95 a yard, plus they have a 5.00 flat shipping rate. It would be easy to line your curtains with it. I've also gotten it (for similar prices) at Home Fabrics - but I don't know if you have one of those close to you. Plus they sell out quickly. Big fan of your blog. We have them at JoAnn's - I am in Ohio. I am sure you could find online?! Love the new look!! !